The Crookston Civic Arena located on the banks of the Red Lake River at 220 Robert St. E in Crookston Minnesota opened in 1937 initially with one rink called the Winter Sports Arena featuring natural ice and a vintage domed wood truss barrel roof with wooded beams throughout the arena. 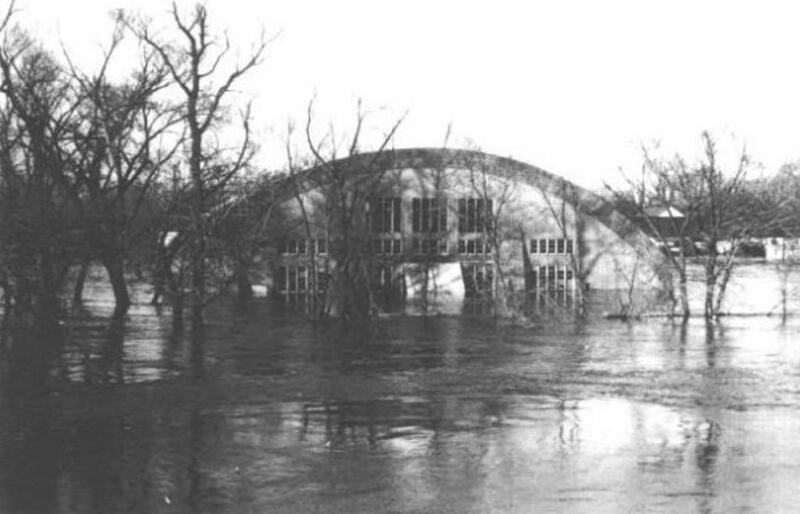 The arena was made possible by the Minnesota Works Progress Administration and was officially dedicated on October 14, 1938. 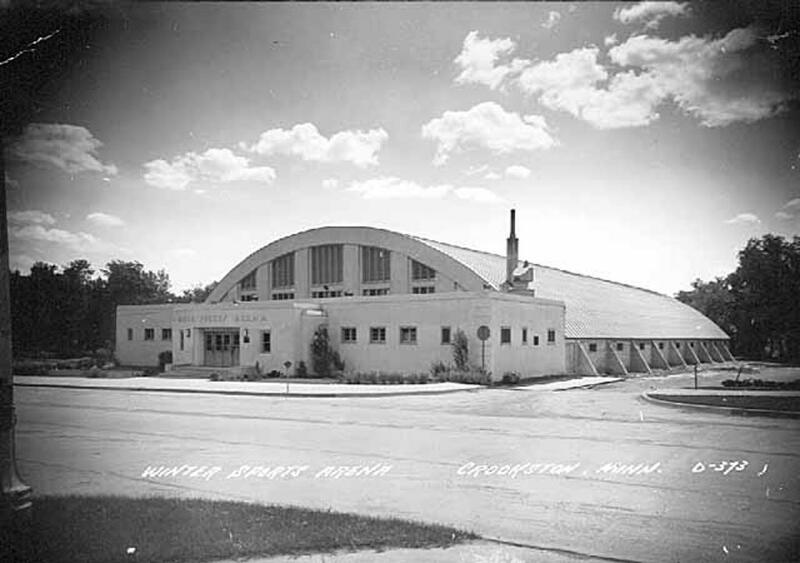 Crookston's Winter Sports Arena was the direct outgrowth of efforts of the Veterans of Foreign Wars and the American Legion to find a place in which to hold meetings of their respective posts. First they attempted to obtain a room in the National Guard Armory: failing in this, members of the two veterans' organizations then proposed that the basement of the City Hall be remodeled and turned over to them. This effort, too, failed of realization and member of the Legion and the V. F. W. then met with the Crookston Association of Public Affairs and suggested that a building for recreational purposes be constructed, with quarters provided for meetings of Boy Scouts, Campfire Girls, the Legion and V. F. W. posts. Some time later, both veterans' organizations met again with the Crookston Association and member of the Crookston City Council. Works Progress Administration officials from Second District, Detroit Lakes, attended this meeting, at which the veterans suggested that a special election be held on a bond issue proposal to finance the sponsor's cost toward erection of what became the Winter Sports Arena. The city council agreed to hold the election, provided that the Legion and Veterans of Foreign Wars obtained the service without charge of election judges and the free use of the polling places. Accepting the challenge, the Legion and V. F. W. promptly obtained free service of the judges and rent-free use of polling places. The special election was conducted on May 5, 1937, and resulted in one of the largest majorities in favor of a bond issue ever recorded in Crookstons' history. Plans for the Arena were drawn by Theodore B. Wells of Grand Forks, N.D., with the assistance of the then City Engineer, Mr. Lee R. Boyd, and Mr. Lester W. Newberry. After long discussions and several meetings with J. B. Kovarik and W. P. A. officials the present site on U. S. Highway No. 2 at the entrance to the city was selected. 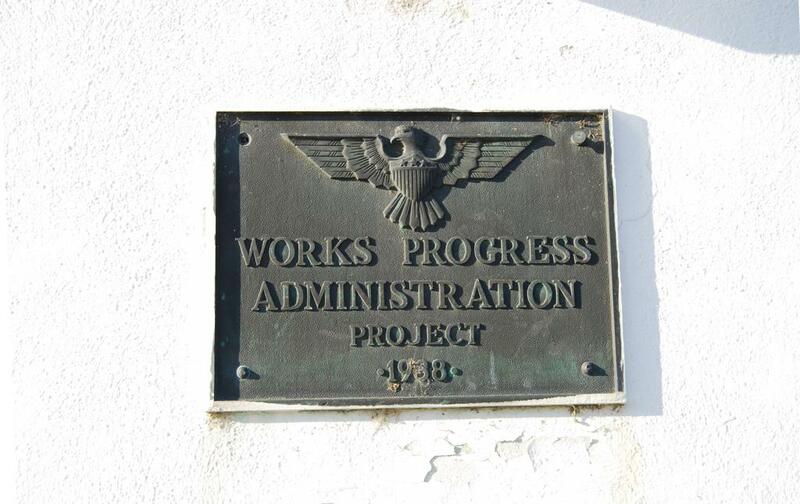 Construction was begun by the Works Progress Administration on October 4, 1937, just five months after approval of the bond issue by the voters of Crookston. 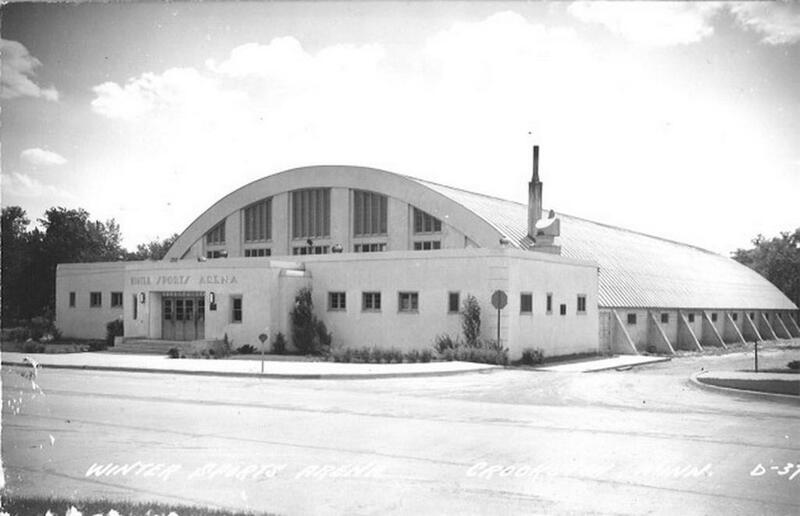 The building was completed ten months later and dedicated formally on October 14, 1938, at ceremonies attended by Governor Elmer A. Benson, Mayor John Queen of Winnipeg, Manitoba- Canada; Major B.M. Harloe, executive assistant to the Chief Engineer, Works Progress Administration, Washington, D.C.; Mr. Roy C. Jacobson, Acting State Administrator, Works Progress Administration; Mayor William J. Kirkwood of Crookston, and a host of other dignitaries from Canada and the United States. 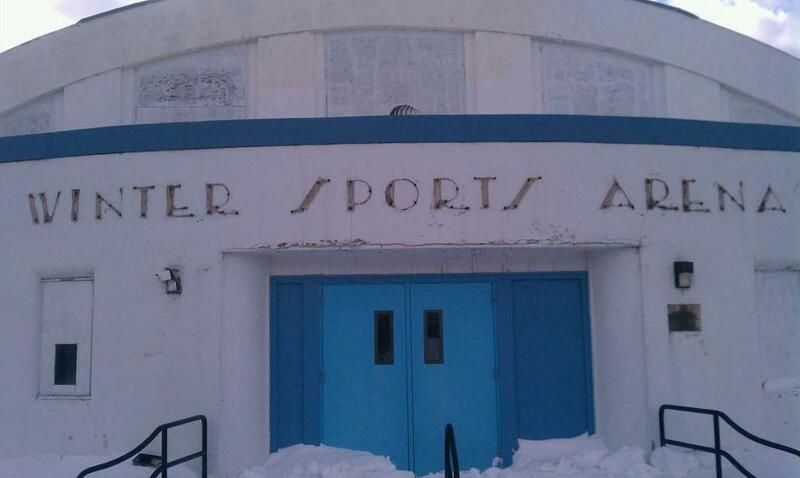 The Winter Sports Arena, built by the Minnesota Works Progress Administration District No. 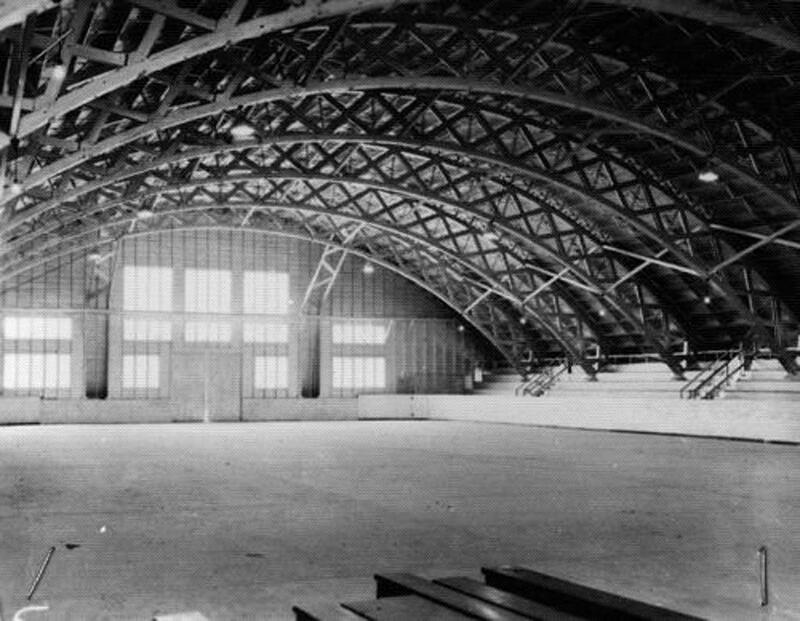 2, with headquarters at Detroit Lakes, is 110 x 233 feet, with laminated arched trusses resting on concrete buttresses which reach an extreme height of 36 feet above the concrete playing floor. The front portion of the building, of frame and stucco construction, houses the lobby, ticket office, check room, shower rooms, furnace and fuel rooms. In the rear are a playing floor, 180 x 80 feet and bleachers on three sides with a seating capacity initially of 2,500. 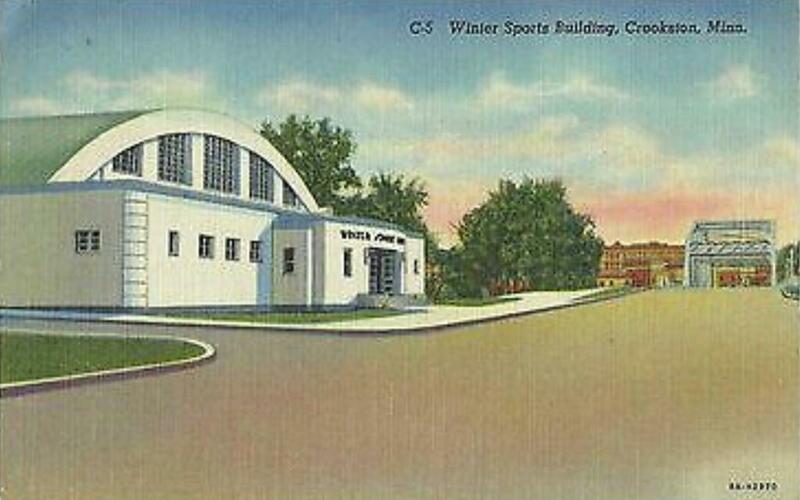 In building the Crookston Winter Sports Arena, the Works Progress Administration gave approximately 60 men useful work for 10 months, or a total of 6,000 man-hours of labor which, but for the Works Progress Administration and the far-sightedness of the Sponsor, the City of Crookston, would not have been given these hitherto jobless workers. 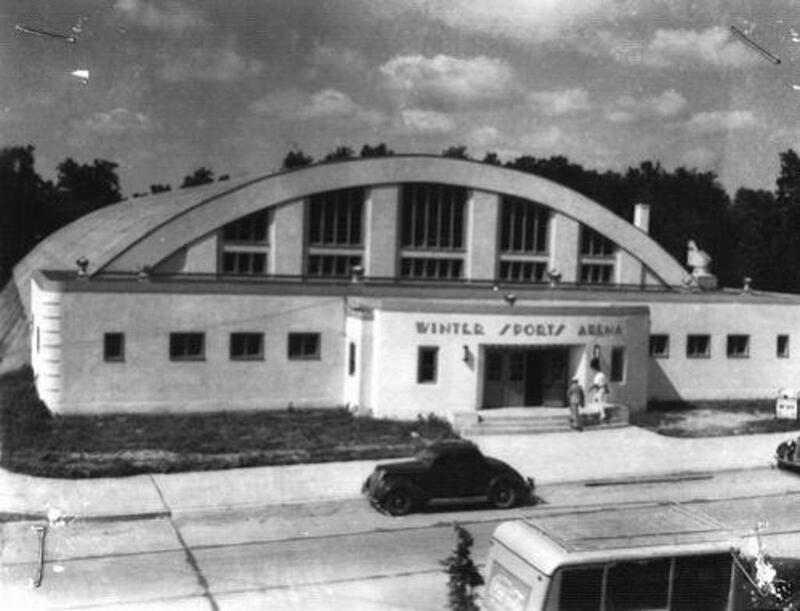 The Sports Arena was designed especially for public skating and ice-hockey, but was used throughout the years for other activities including: conventions, concerts, exhibitions, dances, and other indoor athletics of various types. Offices on the second floor accommodate the Crookston Association of Public Affairs and were used as a meeting place for various civic organizations. 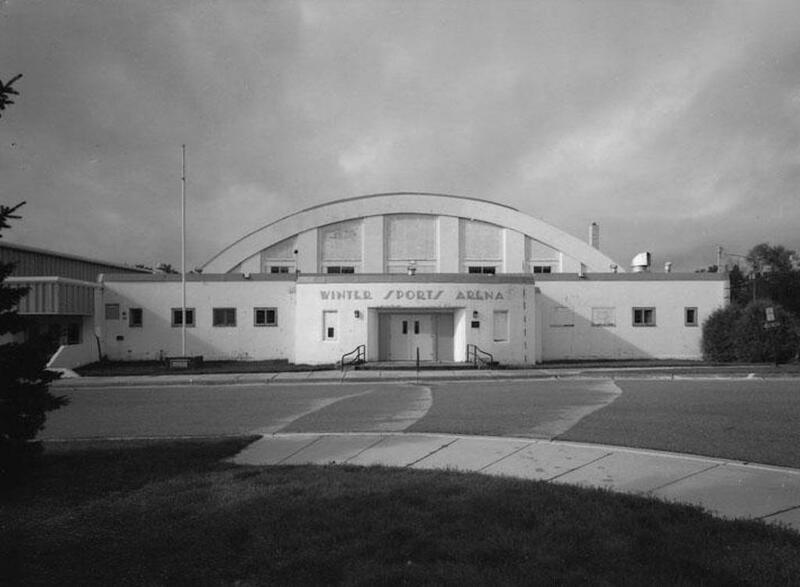 The arena was also the site of the 1951 AHAUS Senior Tournament with the hometown Crookston Pirates winning the championship over the New York Metropolitans 12-5 in a two-game, total-goal series. The Winter Sports Arena boasts a smaller than usual ice surface measuring at 180ft. x 80ft. 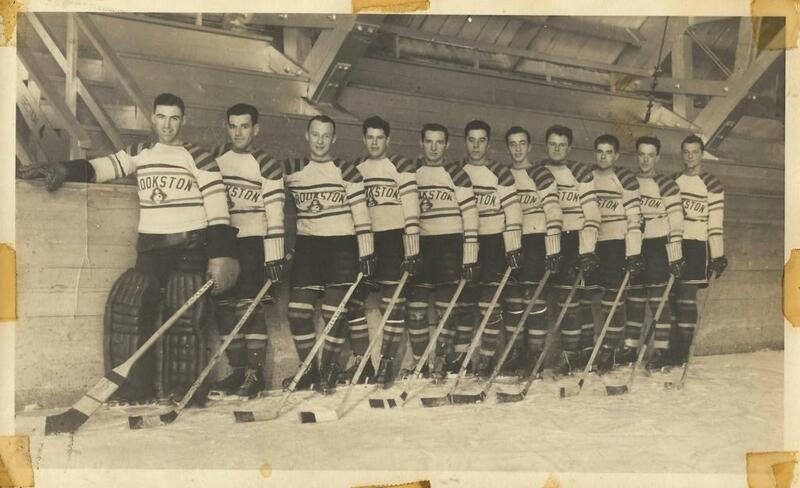 and upon building more locker rooms the seating capacity was narrowed from 2,500 to only 700 spectators within this vintage arena. 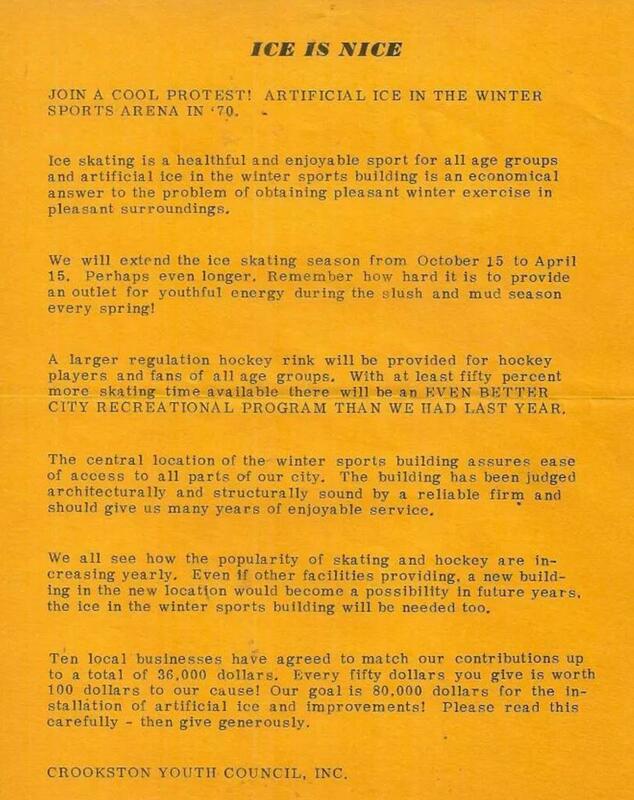 In 1971 -some 34 years after it opened its doors- the Winter Sports Arena saw the addition of artificial ice with the installation of an ice plant. 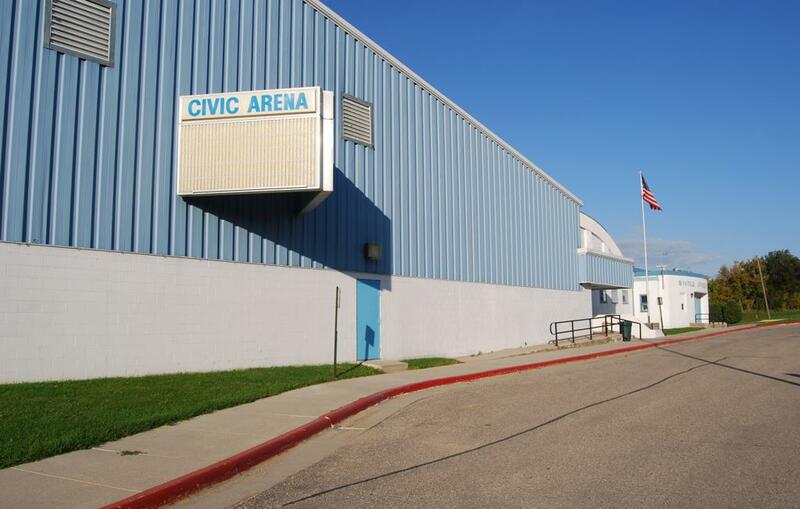 Seven years later, in 1977-1978 the roomier Crookston Civic Arena was added adjacent to the Winter Sports Arena with a standard sheet of ice at 200ft. x 85ft. and enough room to "pack" some 1189 people in to cheer on the Crookston Pirates high school boys and girls hockey teams, as well as the Crookston Golden Eagles college hockey team whom call these 2 rinks their home. In 2008 Governor Pawlenty passed a budget bill as initially introduced in the state's 85th Legislative Session for 2007-2008 that Pawlenty decided to use his line-item veto authority rather than taking down an entire $925 million bonding bond bill. Pawlenty let $717 million worth of projects stand, including $10 million to re-locate the Crookston Ice Arenas, which will be torn down and then a new three sheet ice arena complex to be built in the north end of Crookston. "Crookston's request was tied to a flood prone area and near the river and why it is in the bill," said Governor Pawlenty. The Governor also included and did not cut the $30 million flood mitigation money which Crookston also is included in as they continue the city's flood projects. "It looks pretty good for Crookston and some other projects in the area," said State Representative Bernie Lieder, a DFL-er from Crookston. Funding for four construction projects and facility repairs are included in the bonding bill Gov. Tim Pawlenty signed April 9 in Brown Hall auditorium at the SCSU campus, including plans for St. Cloud and the National Hockey Center renovations and improvements, University of Minnesota Duluth to receive a new home ice rink, and a new modern sized D1 rink to be constructed for Bemidji State University. Pawlenty had been given the nickname -in Minnesota hockey circles- as the "Rinks Governor"
After numerous years of sitting in a flood plain on the banks of the Red Lake River, with fear of flooding over come each spring, the City of Crookston will finally see the addition of a new 3 sheet ice rink facility near the Crookston High School with contruction already underway. 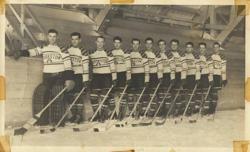 Vintage Minnesota Hockey.Com wishes to keep the memories of this vintage 1937 WPA built wooded-truss arena alive forever here in these displayed photos of this once historic arena. The arena opened for it's final season October 1, 2009 and was later demolished in March of 2011.